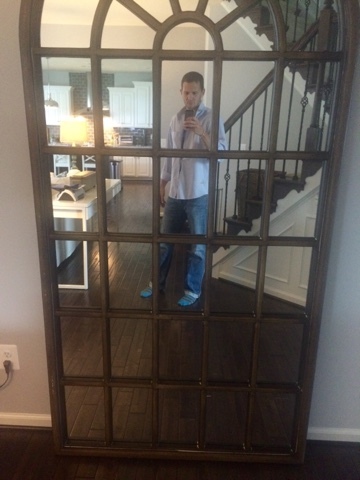 Way back in September of 2014 I was on the lookout for a large floor mirror for our living room. I stumbled upon a great buy on Joss & Main and Matt and I decided to pull the trigger and order. 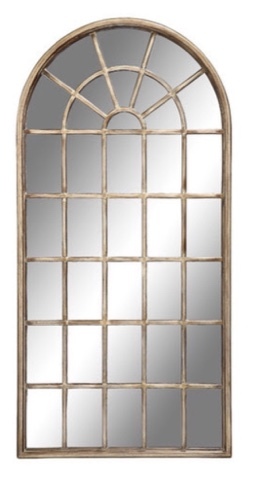 We have ebony color hard wood floors and the gold/brass finish of the mirror was exactly what I was looking for. We scheduled delivery for a day Matt was teleworking since I was still working at Discovery at the time. After the scheduled delivery time I get a text from Matt: "Is this the right color?" It was the exact same color as our floors and had ugly white paint/caulk marks all over the mirror (hard to see in the picture). And it was not a intentional "distressed" look. I was so bummed and I called Joss & Main, sent them a picture and they apologized that it didn't match the listing. They returned our money and asked if we would like them to pick it up or if we had a way to dispose of it ourselves. Immediately I told them we had a way to dispose of it since we lived in an active construction zone with plenty of dumpsters around (and I really didn't want to have to schedule yet another day for delivery men). It wasn't until I hung up and told Matt that they just returned our money and said we could dispose of it ourselves that it hit me - I just scored a free $550 mirror to refinish! I was very overwhelmed with how I would refinish it since I couldn't think of anything worse than taping off each pane prior to painting, etc. Plus I really wanted a gold finish and paint wouldn't quite give me the look I desired. The mirror sat pitifully in the office for 6 months. Here you can see just two of many of the undesirable white marks. Approximately 6 months later the answer to my mirror woes hit me - Rub 'n Buff! I tested a small spot and loved the finish so I pushed forward. I simply slipped a piece of paper under the pane as I rubbed ('n buffed) using a paper towel and when it did get in the mirror I wiped it off easily with a clean paper towel. In full disclosure I did this over a period of 3 months for about an 30 minutes to an hour at a time when I had that time to spare. It probably took a total of 6 hours. I am beyond thrilled with the final result! So worth all the work and wait and it only cost the price of one tube of Rub 'n Buff! P.S. I love Joss & Main, their customer service is exceptional. We had an issue with a clock arriving broken and they shipped me another one immediately and told me to dispose of the broken one. So you know what I did right? Googled how to fix clocks and now I have 2 for the price of one!